The McCracken Research Library collections contain many rare, valuable, and unique items that require special security measures when using the collection to assure they are available for future generations. We ask your patience and understanding as we try to strike this sometimes difficult balance between preserving rare and fragile items and making them accessible. Student researchers from an area high school crowd the library’s reading room table. 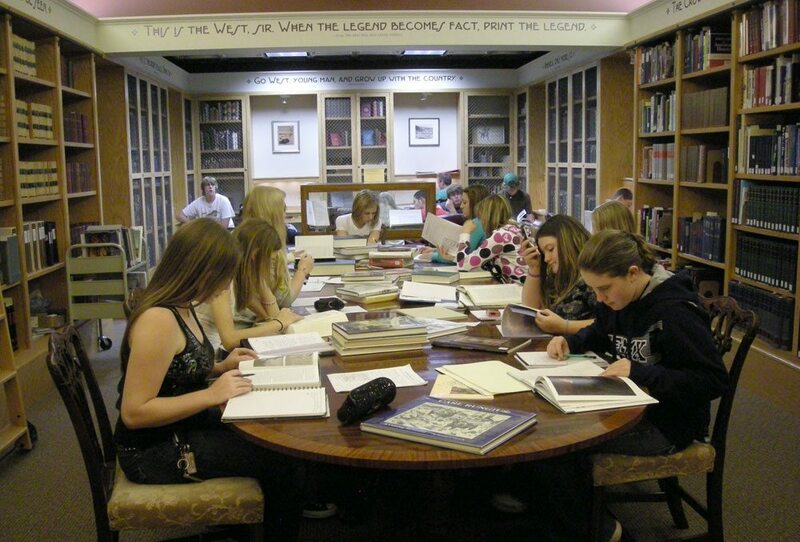 All library collections are non-circulating and must be used in our facility at the Buffalo Bill Center of the West. Books and archives are housed in secure, non-browsing stacks and are retrieved for users upon request, except for some reference resources on open shelves. Archival and manuscript materials are available by appointment. Use of certain collections and materials may be restricted by statute, by the office of origin, or by the donor. Researchers assume full responsibility for the use of any restricted materials. The library staff reserves the right to restrict use of materials that are not processed or are in the act of being accessioned, or those of exceptional value or fragility. Upon arrival at the McCracken Research Library, you must register by providing your full name, address, and phone number. All visitors are asked to register, including those who accompany researchers. After registering, and prior to using the reading room, you will check all personal items, including coats, jackets and sweaters, into a locker. McCracken Research Library staff is not responsible for providing security for personal items left outside of designated lockers. Lockers are located in the library, and at the Front Entrance to the Center. When leaving, please remove all personal belongings from lockers. Only loose paper is allowed in the reading room and is provided if necessary. Pages that are stapled or paper-clipped in one corner may be brought into the reading room. Only pencils may be used for note-taking and forms. No ink pens are allowed near library materials. Researchers are permitted to use laptops without cases. Books required for research from personal collections may be used in the Reading Room with staff approval. These are generally restricted to special needs, e.g. when comparing texts, or using a language dictionary. Do you have a research question you just can’t seem to find the answer to? Our librarians are stellar sleuths! E-mail us your question!